File image of a San Francisco police car. 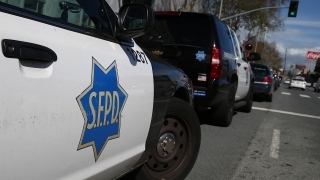 Police are looking for a male suspect who allegedly struck another male with a hatchet in San Francisco Wednesday. Officers say the 38-year-old victim was walking home at around 1:00 a.m. near Golden Gate Avenue and Jones Street when the suspect yelled at him and struck him with a hatchet before running off in an unknown direction. The victim was transported to a hospital with life-threatening injuries.